I’m going to start this review with a bold statement – this book will make my top ten reads of 2015. Yes it was so good that I can’t see me coming across ten other books that will beat this one. So what’s it about? Well as with any book that depends on the reader not knowing very much before they start to appreciate the story, I can’t tell you very much! I can tell you that our chief protagonist, Catherine Ravenscroft has just moved house to a new apartment with her husband Robert when she comes across a novel. Idly picking it up the book entitled Perfect Stranger with the standard disclaimer; any resemblance to persons living or dead scored through with red pen. She starts to read and to her horror she realises it is about her, and more specifically about a secret that she has kept for the last twenty years. All the reader knows at this stage is the secret involves her son Nicholas, their less than successful son, who at Catherine’s instigation has moved into a shared house in a bid to foster some independence and responsibility into his life. Of course the questions raised by the book are what is the secret? And just as importantly who knows and cares enough to write a book about it? Alternating with Catherine’s narrative we hear from another voice, that of a lonely old man, mourning the death of his wife, Nancy but at last determinedly clearing his house of her belongings, packing her clothes away and giving them to charity shops where he gets given cups of teas and a chance to talk about Nancy. The reason I enjoyed this book so much was the way that Renee Knight skilfully played on my emotions, changing my opinion of all of the characters who populate this book with an ease that left me reeling. My once certain opinion swept away in a single sentence as another piece of information is casually dropped into the narrative. This is a book of suspense but not of the obvious kind, the tension is palpable and illustrated by Catherine’s actions rather than internal monologues about how scared she is, as she turns from a capable and decisive documentary maker into a scared shadow as she wonders what will follow, how far is the author prepared to go to completely destroy her life? Should she take the ending as a warning, all of these thoughts push real life to the periphery as she valiantly tries to keep the secret under wraps. Readers that aren’t keen on protagonists they don’t like may well not enjoy this as much as I did but although many of the characters in this book behaved in a way I wouldn’t, at no point did their behaviour seem out of character, they were real people behaving in realistic ways albeit at the edge of their sanity at times and I was utterly convinced. I’d like to say an enormous thank you to the publishers Random House UK firstly for publishing this book, and secondly for allowing me the great pleasure of reading it. 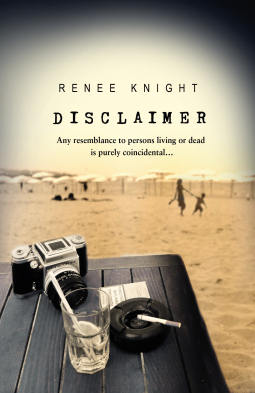 Disclaimer will be published on 9 April 2015 and it is a must for lovers of psychological thrillers. It really is an excellent read, I do hope you enjoy it! What a wonderful review, Cleo! This is on my list already, and your review just makes me want to read it all the more. Ah thank you – I hope you enjoy it as much as I did! Great review, as ever – I think it’s the first one that’s given me some information about the book! I started it a couple of times, decided to wait until nearer the time of it’s release, and now we’re here I’m overwhemed by books – all really good, all essential to be read and reviewed! Aaargh! I must squeeze it in somehow! You do need to put this near the top., it’s so hard to say much about the book without spoiling it for others so I hope I succeeded. As Fleur says below, Great premise! Some of the best books recently have had simple premises – what if on your everyday commute you saw something that turned out to be connected to a murder? What if an estate agent never returned keys, and lived life vicariously through his clients? This one’s probably come from someone idly reading the disclaimer line, “bears no resemblance to anyone, living or dead…”, and thought , what if? (This makes coming up with a best-selling novel sound really easy, but OBVIOUSLY it isn’t, otherwise everyone would be reviewing my book, or Cleo’s!) But sometimes simple seems to be the best place to start, it would appear…then it gets complicated – and I get stuck…! I love the premise and that’s a bold claim – sold! It definitely had an original feel to it and it was exceptionally well executed for a debut novel. Oh, this sounds really intriguing, Cleo! I like the premise too – really original! And the story does sound suspenseful. Thanks as ever for your thoughts on this. The original premise had me intrigued (and of course it featured a book) but I was pleasantly surprised at how well the author manipulated my opinions. Great review. I’m going to hunt down a copy of this book. You have intrigued me. I do so love a good psychological suspense read! Thank you – I love psychological novels too and this one had that something extra! I do hope you find a copy and enjoy it as much as I did. I must say I found the premise of this one intriguing, so I’m delighted to hear that the book lived up to it. One for the TBR… thank you! Oh I’m delighted, it’s been a while. I was hooked by the premise and was wowed by the execution. You have definitely piqued my curiosity! I especially like the idea of the author dropping in bits and pieces of info that change how you see everything. What fun! Thanks for sharing. Sounds great! I’ll definitely look for this one when it’s released in the US. Gosh Cleopatra, just reading your description of it made me feel quite anxious! This sounds like a book vital to be accompanied by soothing chocolate, and, possibly whilst down with a heavy cold so you can get out of all engagements which might take you away from feverish page turniing! A strong recommendation. A book that does this: “changing my opinion of all of the characters who populate this book with an ease that left me reeling” is worth checking out. I am always amazed when authors manage to ‘play’ me as well as this one did! This book sounds good. I really liked to dive in a story that played readers emotions with the secrets and all. Nice review! Thank you Al for your kind words – as you can tell I really enjoyed this one. I did think this might be one you would be interested in – I hope you enjoy it if you get around to reading it. Oh excellent, this is great so I hope you enjoy it if you get around to reading it. I’ve not heard of this one, so thanks so much for the review. Definitely adding this to my wishlist! No… I didn’t suspect at all – that’s the appeal of the reread to see if there are foreshadowing hints well hidden. Yes, that’s why I want to read it again too. Great review, you bring out some very interesting points. I had never really thought about people not enjoying a book because they don’t relate much to the character. In my case, if a character is well developed and the way they speak/think/act is according to that, then it is a good character in my book. I’m with you Ana and it made perfect sense to me. As long as the character stays in the role created then I can believe in them. Besides, it’s great when you find those characters. Main ones these days always seem to have pretty much the same characteristics. For instance, in the genres I usually read (fantasy/sci-fi, some horror), every main character seems to be a teenage girl, with characteristics which to me are or get annoying, coming out of averageness and becoming a heroin, most times overnight with not much of a transition. So books like Disclaimer are a breath of fresh air. I cannot wait to dig into it.